American Idol revealed seven of the season's Top 14 contestants during Monday night's two-hour broadcast on ABC. After 12 of the Top 24 artists each performed a solo as well as a duet with an all-star in the music industry over the last couple of nights, American Idol judges Katy Perry, Lionel Richie and Luke Bryan had to advance only seven individuals to the next phase of the competition in which home viewers will vote. The following artists made the Top 14: Cade Foehner, a 21-year-old college student from Shelbyville, TX; Gabby Barrett, a 17-year-old high school student from Pittsburgh, PA; Catie Turner, a 17-year-old high school student from Langhorne, PA; Michael J. Woodard, a 20-year-old bowling alley attendant from Philadelphia, PA; Dennis Lorenzo, a 26-year-old singer from Philadelphia, PA; Jonny Brenns, an 18-year-old college student from St. Augustine, FL; and Michelle Sussett, a 22-year-old waitress from Miami, FL. Since those seven artists advanced, five contestants -- including fan-favorite Layla Spring, a 16-year-old high school student from Marion County, KY -- were sadly cut from the competition. The American Idol judges also decided to eliminate Dominique, a 26-year-old legal secretary from Birmingham, AL; Kay Kay Alexis, an 18-year-old from Nashua, NH; Brandon Diaz, a 21-year-old college student from Ashburn, VA; and Trevor McBane, a 22-year-old goat farmer from Savanna, OK.
Last night's American Idol episode featured the 12 contestants performing with either Andy Grammer, Bishop Briggs, Jennifer Nettles from Sugarland, Aloe Blacc, Luis Fonsi, Allen Stone, or Pat Monahan. First up was Catie Turner with Andy Grammer for a performance of "Good To Be Alive." Andy called Catie "amazing" and "fantastic," and the judges agreed she's a natural as well as a star. Catie was told she pulled off "incredible harmonies" and was "soaring all over the place." Lionel joked about Catie having several people of all different ages inside of her because she comes across as such a seasoned performer. Lionel said Catie "killed it," and Luke added that it sounded like Andy and Catie had been on tour together all year long. Next was Cade Foehner singing "Never Tear Us Apart" with Bishop Briggs. Lionel said his collaboration skills are amazing, and then Luke asked Cade to come on tour with him, advising him to "keep going" because he's the real deal. Katy agreed that Cade has something special. Layla Springs then sang "Stuck Like Glue" with Jennifer Nettles. The judges agreed it's very intimidating and challenging to go toe-to-toe with a singer like Jennifer but she was "very brave" and did a great job. Katy said Layla has the makings of a star because of her talent and personality. Dominique performed "Wake Me Up" afterward with Aloe Blacc, who told the judges, "This is an 'American Idol' right here." Katy admitted she had lost her ability to critique because all of the contestants were "arriving" and "showing up" when it counted most. Lionel noted Dominique's vocals were "so smooth" and he's "capable of being famous." Luke also complimented the artist's versatility, calling him "a world-class singer." Brandon Diaz then performed "Despacito" with Luis Fonsi, and the pair performed in Spanish. Luis admitted the lyrics of the song are very "tricky" but Brandon "nailed it." Lionel couldn't believe Brandon had this "secret arsenal" of talent tucked away, and the judges thought he really rose to the occasion of singing with Luis. Luke noted Brandon did a great job and he was "sold" on the artist. Katy added that she saw "so many different shades" of Brandon. Kay Kay was up next with a performance of "Drive By" with Pat Monahan. It was clear Kay Kay was out of her comfort zone with this song, but she did the best she could with it. Luke commended Kay Kay on a great job, especially since she had to sing with "a monster" vocalist like Pat. He said she "took care of business" and executed a nice first duet. Katy insisted Kay Kay can definitely sing and the song was like a blend of two different fruits. The next duet of the night belonged to Trevor McBane and Bishop, who took the stage with "River." Katy thought Trevor's performance was "a triumph" because Bishop is incredibly gifted as a vocalist. Lionel called Trevor "the real deal," and then Luke acknowledged it's clear who Trevor wants to be as an artist. Michelle Sussett then sang "I Can't Make You Love Me" with Luis. Lionel could see their chemistry radiating onstage, and he said the duet was "a pleasure to watch." Luke thanked the pair for providing "a real moment" for the audience, adding that he felt like a fan during that performance. Michelle also made a believer out of Katy, who noted "the world is [Michelle's] oyster." Moving on to Jonny Brenns and Andy. After an excellent vocal performance of "Back Home," Luke explained it was nice to see Jonny branch out and try a more upbeat song, but with the change came some criticism in that the judges thought Jonny lacked stage presence. Katy therefore suggested he should take a few ballet lessons to help with his movement onstage -- if he wants to get to the Top 5. Dennis Lorenzo and Allen Stone then performed "Unaware" for their duet. Allen was so happy with the song, in fact, that he jokingly admitted to the judges he may never sing it alone again. Katy said it was "so special," insisting Dennis must keep going and continue writing songs. Lionel confessed Dennis was actually "sparring" in that song with Allen, showing "incredible skill and magnitude." Lionel then called the duet "spectacular." Luke referred to Dennis as "the little engine that could" and admitted "no one could tell the difference" between the contestant and the professional. Next up was Michael Woodard and Pat with a performance of "Angel In Blue Jeans." "You are really rising to the occasion," Lionel told Michael, before Luke confessed he couldn't take his eyes off the singer. Luke asked Michael to always hold on to his naive nature and smiling face, and Katy added that the artist is "a beautiful chameleon" thanks to his versatility and authenticity. The judges have also learned that Michael always sings with his big heart. The last duet of the night belonged to Gabby Barrett and Jennifer Nettles, and Gabby had another "wow" moment on the show. After singing "Stay," Luke gushed of Gabby, "I don't know if we've seen somebody today nail it from top to bottom." Katy complimented the singer by saying, "Way to show up!" The judge also noted that Gabby refuses to get comfortable on the show, which is the key to success. Lionel was also pleased that Gabby took all of the judges' advice and channeled it into her performance. Next week, the remaining Top 24 artists will each perform a solo followed by a duet with an all-star. Those 12 contestants will then be narrowed down to only seven, just like this week. 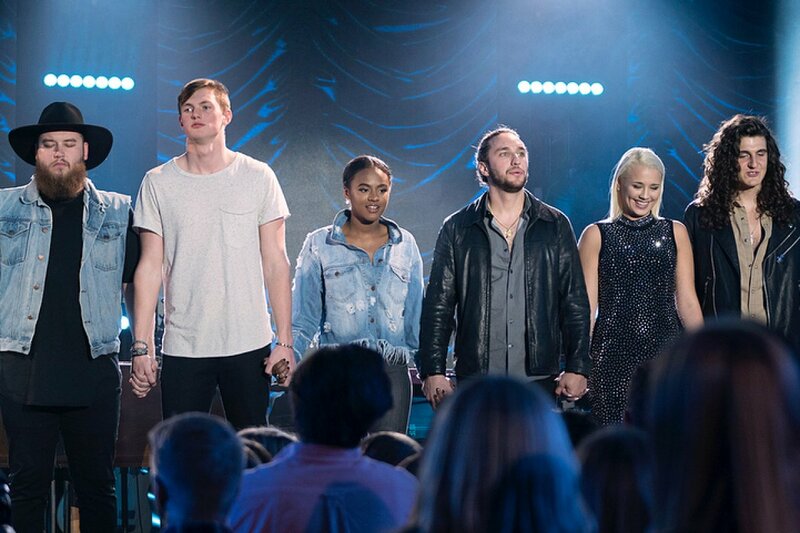 The results will give America its Top 14 contestants for American Idol's sixteenth season!